Bicentennial Art Center and Museum, 132 S. Central Ave., Paris. Regular hours: 10 a.m. to 4 p.m. Tuesday through Friday. Closed Saturdays, Sundays, Mondays. 466-8130. Catlin Heritage Museum, 210 N. Paris St., Catlin. 1827 Amos Woodin Home open for tours. Exhibits, featuring handcrafted items from locals. Regular hours: 9 a.m. to 3 p.m. Monday and Wednesday; and by appointment. Free; donations accepted. 427-5766. C.H. Moore Homestead and DeWitt County Museum, 219 E. Woodlawn, Clinton. Victorian mansion, gift shop, displays, three farm buildings and a large barn. Admission $1-$3, under 12 years free. Regular museum hours: 10 a.m. to 5 p.m. Tuesday through Saturday; 1 to 5 p.m. Sunday. Closed Mondays. 935-6066. Champaign County Historical Museum in the historic Cattle Bank, 102 E. University Ave., C. "The Cattle Bank's Turn of the Century Grocery Store" and "Champaign County Fights For America" are both permanent exhibits. Exhibits also include replica of old downtown grocery store; items from Illinois Central Railroad; lifestyles room showing period clothing in 1800s kitchen and parlor. Regular hours: 10 a.m. to 5 p.m. Wednesday through Saturday; 1 to 4:30 p.m. Sunday. Closed Mondays, Tuesdays. Free. 356-1010. Depot Railroad Museum, East Benton Street at CSX Transportation, Rossville. Housed in former Chicago and Eastern Illinois Railroad Depot. Operating HO layout and railroad history displays. Hours: noon to 4 p.m. Saturdays and Sundays during the summer. Free but donations appreciated. 359-2868. Douglas County Museum, 700 S. Main St., Tuscola. Free. Regular hours: 9 a.m. to 4 p.m. Monday through Saturday; 1 to 4 p.m. Sunday. 253-2535. Dukes Museum of Militaria, No. 4 Kings Drive, Georgetown. Display of more than 8,000 shoulder insignia, plus WW II memorabilia. Georgetown WW II honor roll. Call for appointment. Free. 662-6825. Early American Museum, Lake of the Woods, 1/4-mile north of I-74 on Illinois 47, Mahomet. Exhibits include "A Railroad Runs Through It: The Architecultural Heritage of Six Illinois Towns," "Prairie Stories," "Blacksmithing on the Prairie." "The Question Now Before Us: Challenges, Choices & Changes for Champaign County, 1850-1870," "The Discovery Room" and "John Deere Buggy and Phone Exhibit." Summer hours: 10 a.m. to 5 p.m. Monday through Saturday; 1 to 5 p.m. Sunday. Regular hours: 1 to 5 p.m. daily. Closed in January and February. Free. 586-2612. Georgetown Historical House, 510 N. Main St., Georgetown. Five rooms of memorabilia from Georgetown's past including mining artifacts, Civil War pictures and mementoes and pictures. Open by appointment. 662-2273, 662-6656. Harris Agricultural Museum, 202 W. Locust Ave., Atwood (on Route 36 west of Tuscola). Featuring the agricultural era of the early 1930s in the central United States. Nearly all of the equipment is operational and consists of a wash house, 1920s kitchen, blacksmith shop, grocery store, 1919 Model T Ford dump truck, hit and miss engines, thrashing machine and a 1904 Whitman hay press. Donations accepted. Regular hours: 8 a.m. to 4 p.m. weekdays or by appointment, 578-2231 or 578-3040. Illinois Amish Interpretive Center, 111 S. Locust St., Arcola. Amish museum and introductory video show history, faith and lifestyle of Old Order Amish of central Illinois. Regular hours: 9 a.m. to 5 p.m. Monday through Saturday. In the winter, open by appointment only. Admission: $2.25-$2.75; children under 6 free. (888) 452-6474. I&I Historic Farm Museum, 10 miles east of Rantoul, just off U.S. 136 on 309 E. Busey St., Penfield. Established by I&I Antique Tractor & Gas Engine Club. Antique farm machinery and tools, household exhibit, restored log cabin, blacksmith shop. Summer hours: 11 a.m. to 2 p.m. Friday and Saturday or by appointment. October through May, open by appointment only. 379-3909, 863-2681. Johnny Gruelle Raggedy Ann and Andy Museum, 110 E. Main St., Arcola. The 2,000-square-foot exhibit traces the history of Johnny Gruelle and the doll he created in 1915. Regular hours: 10 a.m. to 4:30 p.m. Tuesday through Saturday. Closed major holidays. Closed January and February. Admission: adults $1, children free. 268-4908. Korean War Veterans National Museum and Library, 1007 Pacesetter Drive, Rantoul. Hours: 1 to 5 p.m. Sunday; 10 a.m. to 5 p.m. Monday through Saturday. Admission: $3-$5, children ages 4 and younger free. 893-4111, 888-295-7212. Monticello Railway Museum, Iron Horse Place, Monticello. Museum cars to walk through and many pieces of rolling stock to view at the museum site. Hours: 10:30 a.m. to 5 p.m. Saturday; noon to 5 p.m. Sunday. Trains depart from museum site at 11 a.m., 12:30, 2 and 3:30 p.m. Saturday, 12:30, 2 and 3:30 p.m. Sunday; from Wabash Depot, Railroad Street at 11:30 a.m., 1, 2:30 and 4 p.m. Saturday, 1, 2:30 and 4 p.m. Sunday. Fares: $5-$8, children age 3 and under free (with adult). Closed during the winter. 762-9011. The National Museum of Ship Models and Sea History, 201 E. Market St., Sadorus. Exhibit of 130 models from all periods of history with sea artifacts, historical paintings, documents relating to the sea and model ships from movies. Hours: 11 a.m. to 4:30 p.m. Saturday. Closed in January and February. Admission $4. 398-1998. Octave Chanute Aerospace Museum, 1011 Pacesetter Drive, Rantoul. Regular hours: 10 a.m. to 5 p.m. Monday through Saturday; noon to 5 p.m. Sunday. Admission $4-$7. 893-1613. Orpheum Children's Science Museum, 346 N. Neil St., C. Hours: 9 a.m. to 6 p.m. Tuesday; 1 to 6 p.m. Wednesday through Sunday. Admission $2-$3, children under 2 and members free. 352-5895. Rossville Historical and Genealogical Society Museum, 103 W. Attica St., Rossville. Hours: noon to 4 p.m. Tuesday and Saturday or by appointment. 748-4080. The Spurlock Museum, 600 S. Gregory St., U. Temporary exhibitions as well as six permanent galleries. Hours: noon to 5 p.m. Tuesday; 9 a.m. to 5 p.m. Wednesday, Thursday and Friday; 10 a.m. to 4 p.m. Saturday; noon to 4 p.m. Sunday. Closed Mondays. Free. 333-2360. Vermilion County Museum and Fithian House, 116 N. Gilbert St., Danville. Two permanent exhibits of Lincoln-Lamon law office in Danville (1852-1856) and a one-room school house; natural history displays, a coal mine shaft, "Danville on the Dixie" and "Through the Pages of History – the First 175 Years of Vermilion County, Illinois." Admission: $1-$2.50, children 12 and younger free. Regular hours: 10 a.m. to 5 p.m. Tuesday through Saturday. Closed Sundays, Mondays and holidays. 442-2922. 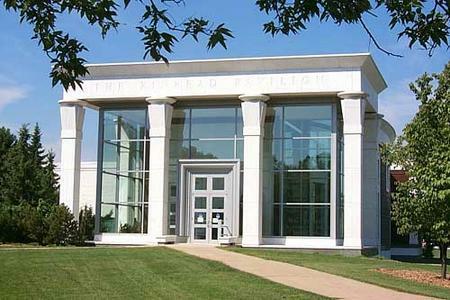 Vermilion County War Museum, 307 N. Vermilion St., Danville. Memorabillia of 10 wars on display. Regular hours: noon to 3 p.m. Tuesday through Friday; 10 a.m. to 4 p.m. Saturday; 1 to 4 p.m. Sunday. Closed Mondays. Admission: $1-$2. 431-0034.